Turbulence Ahead: Where Will The Jobs Come From? I got to participate in 'The Economic Debate' in Google yesterday, chaired by David McWilliams. 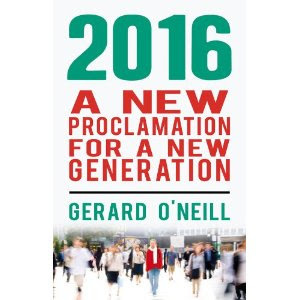 The debaters included Colm McCarthy, John Fitzgerald, Ronan Lyons, Alan Dukes and myself. It was a fascinating discussion, thanks especially to our host Google VP John Herlihy, who had the idea for the debate in the first place. We had some great questions from the audience, and one towards the end got me thinking: where will the new jobs come? 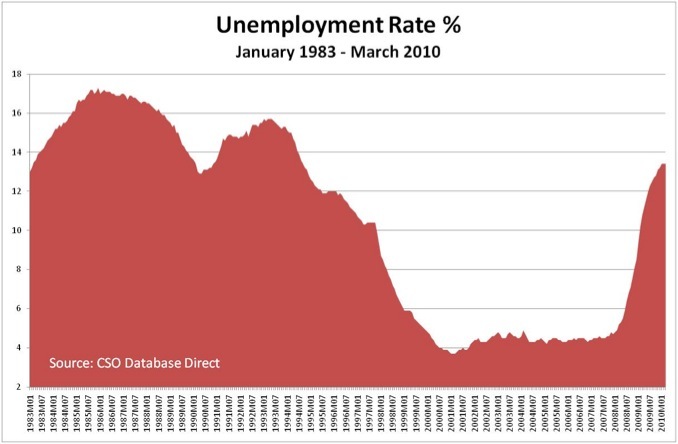 As you can see from the chart, something interesting is going on in relation to our unemployment rate: it seems to have levelled off, and it certainly is no longer on a trajectory to bring us back to the levels we saw in the 1980s and early 1990s. Why is this? Part of the answer is the fact that a lot of people who lost their jobs didn't go on the Live Register: they left the country instead. But I think there's more to it than that. Firstly, the composition of jobs today is different to that in the 1980s: back then it was mostly manufacturing and some services with a residual of agriculture. Nowadays it's mostly services and some manufacturing and an even smaller contribution from agriculture. But the services jobs aren't all in Google and the likes: instead they're mostly in your local coffee shop and newsagent. And the one thing that's different about services compared to manufacturing is that increasing output in the former requires you to hire more staff a lot sooner than increasing output in the latter (which usually means more machinery first). For that reason, I suspect we will see a bounce back in employment (and resultant fall in the live register) a lot sooner than many are factoring into their forecasts right now. Sure, the unemployment rate lags recovery: employers try to get more out of existing staff before taking the risk of hiring new staff. But like I said, when our economy is driven more by services than by manufacturing, the elasticity of demand for labour will be a lot higher than it was back in the 1980s and 1990s. So the lag will be a lot shorter. So in answer to the question: the jobs will come from a lot of the same places they were coming from before the recession - hospitality services, retailing and some professional services. It won't mean a return to the heady levels of employment in construction and ancillary services (that'll take a generation or three), but it will mean more jobs, and more than expected sooner than expected. A debate, eh ? Which areas of disagreement were covered ? What a delight to read something positive.